Spring Conferment of Decoration in 2018｜SANYUKIKI Co.,Ltd. 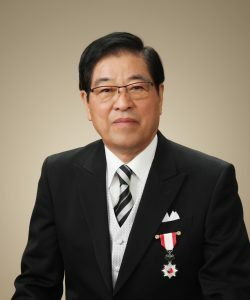 In 2018 Spring Conferment of Decoration, our representative director and CEO : Akira Kawauchi received “The Order of the Rising Sun, Silver Rays” from government of Japan. The decoration is given to those who have made remarkable accomplishments in various fields such as local governments and /or industrial promotion. It is the result of long-time support and encouragement of everyone. We would like to thank you from the bottom of our heart.